This article highlights the features that connect prion diseases with other cerebral amyloidoses and how these relate to neurodegeneration, with focus on tau phosphorylation. It also discusses similarities between prion disease and Alzheimer’s disease: mechanisms of amyloid formation, neurotoxicity, pathways involved in triggering tau phosphorylation, links to cell cycle pathways and neuronal apoptosis. We review previous evidence of prion diseases triggering hyperphosphorylation of tau, and complement these findings with cases from our collection of genetic, sporadic and transmitted forms of prion diseases. This includes the novel finding that tau phosphorylation consistently occurs in sporadic CJD, in the absence of amyloid plaques. The online version of this article (doi: 10.1007/s00401-010-0691-0) contains supplementary material, which is available to authorized users. Cerebral amyloid, tau phosphorylation and cell death: how are they connected? Human prion diseases represent a clinically and pathologically diverse group of neurodegenerative disorders including (1) sporadic Creutzfeldt–Jakob disease (sCJD), (2) inherited forms of prion diseases (inherited prion disease, IPD) such as Gerstmann–Sträussler–Scheinker syndrome (GSS) or fatal familial insomnia (FFI) and (3) acquired forms, such as variant CJD (vCJD), iatrogenic CJD (iCJD) and Kuru. We avoid the term “familial CJD”, as CJD was originally defined as a clinicopathological syndrome which is distinct from e.g. GSS or FFI. The term IPD links the different syndromes by pathogenesis and is therefore preferred. According to the protein-only hypothesis , infectious prions are composed predominantly, if not entirely, of aggregates of misfolded, host-encoded, cellular prion protein (PrPC), commonly designated PrPSc . PrPSc arises from normal prion protein (PrPC) through conformational conversion. The common neuropathological feature of prion diseases is a predominantly extracellular accumulation of PrPSc in the central nervous system. Prion protein deposits are highly variable in their intensity (Fig. 1; Table 1), pattern, i.e. plaques (Fig. 1m–o), perineuronal labelling (Fig. 1p–r), synaptic deposition (Fig. 1j–l) and formation of coarse granular deposits (Fig. 1g–i) and their distribution within the CNS. These deposits correspond biochemically to amyloid, i.e. aggregates of protein with high content of β-sheets. The deposits are accompanied by spongiform change with neuronal vacuolation and degeneration (Fig. 1a–f) and astrocytic and microglial reaction, all of which can vary considerably within the CNS and between different individuals. Whilst prion diseases can be readily transmitted via various routes and between species, the most common Aβ amyloidosis is transmissible at a considerably lower efficiency, and has to date been limited to experimental settings . Another well recognised CNS amyloidosis, familial British dementia (FBD) has not been experimentally tested for transmissibility. In the last few years, a striking number of epidemiological, neuropathological, and biochemical similarities between prion diseases and Alzheimer’s disease have been identified, in particular the fact that there are interactions between the two proteins [41, 59, 74] and between the signalling pathways involving both proteins. Epidemiologically and clinically, both disorders are dementing illnesses that mainly occur sporadically, but can also occur as familial forms. Histopathologically, both are characterised by the deposition of an extracellular amyloid that is produced by neurones. In both diseases, there is formation of amyloid oligomers and ultimately also of solid amyloid aggregates in the brain (Figs. 1g–o, 2a–f; Table 1): both amyloid proteins can accumulate diffusely (Fig. 2a–c), or they can exhibit prominent and widespread deposition of dense amyloid plaques with a diameter of more than 200 μm (Fig. 2d–f), and both elicit a considerable astrocyte and microglial reaction, variable neuronal loss, and occasionally deposition of amyloid in or around vessels walls. Biochemically, both diseases are characterised by aggregation of a protein that is encoded and expressed by the host. It was recently suggested that Aβ42 may act through a PrP receptor [41, 59]. Experimental data suggest that there is a functional link between PrPC and Aβ processing: (1) knockdown of PrPC in N2A cells increases Aβ levels in vitro, (2) PrP knockout mice as well as scrapie-infected mice show increased Aβ level and (3) PrPC overexpression reduces Aβ formation by downregulating the APP cleaving enzyme β-secretase . Recent genetic evidence also links prion disease to Alzheimer’s disease, in that the APOE-Ε4 allele, a well-established risk factor for AD, also may increase the risk for sporadic CJD , but surprisingly may delay onset of inherited prion disease with the P102L mutation . A detailed discussion of the similarities between CJD and AD, the relationship between codon 129 polymorphism and a model of Aβ42 action through PrPC receptor are given in a review by Gunther and Strittmatter . According to the amyloid cascade hypothesis, proposed by Hardy and Higgins  the increased production or decreased clearance of amyloid beta (Aβ) peptides results in the accumulation of the hydrophobic Aβ40 and Aβ42 peptides with subsequent aggregation and formation of insoluble plaques. This induces a cascade of deleterious changes, such as neuronal death and eventually causes Alzheimer’s disease. Since then, this hypothesis underwent several transformations due to the accumulating data supportive of or inconsistent with the theory . The current version assumes a toxic role of soluble prefibrillar oligomers based on the several in vivo and in vitro experiments [37, 42]. The results contradicting these findings [61, 86, 90] and the recognised experimental artifacts  make it more difficult to elucidate their genuine role in disease development. However, a number of recent studies in transgenic mice have further strengthened the concept of the amyloid cascade hypothesis: intracerebral injection of Aβ seeds trigger the aggregation of endogenous Aβ: intracerebral inoculation of APP23 transgenic mice with brain homogenates from Alzheimer’s patients or with brain extracts from aged APP23 transgenic mice elicits a marked anticipation of the disease in young APP23 mice . This finding can be interpreted as prion-like transmission or as seeding process. The latter is a more likely scenario, as implantation of small steel wires coated with minute amounts of Aβ-containing brain homogenate into the brain of APP23 transgenic mice triggered significant deposition of Aβ in the CNS, whilst peripheral inoculation of these mice with Aβ did not seed in the CNS . It may be argued that the presence of a prion receptor, but not of an “Aβ” receptor in peripheral tissues, such as nerve endings or immune cells. Cerebral amyloid and tau hyperphosphorylation: what is the trigger? A prominent feature of cerebral amyloidoses is the induction of tau hyperphosphorylation. This is very well established for Alzheimer’s disease (AD), but is also a prominent feature in the rare FBD and has been sporadically described for prion diseases mostly in the context of the presence of plaques, such as in vCJD or in many inherited forms. A prominent feature of AD is the accumulation of hyperphosphorylated tau within or in the vicinity of cortical amyloid deposits (Fig. 3d–f). Importantly, this direct association of tau pathology in areas of Aβ accumulation has to be separated from a probably independent process of tau phosphorylation that starts in the entorhinal cortex and spreads over the limbic system and finally extends into neocortical regions. This latter process has been characterised in detail and was formalised in a staging system developed and defined by Braak and Braak [10, 11]. The clinical dementia correlates better with the Braak stage than with the deposition of Aβ. FBD is an autosomal dominant, neurodegenerative disorder, presenting with dementia, spastic tetraparesis, and cerebellar ataxia, also known as Worster–Drought syndrome [68, 82, 85, 94]. Similar to Alzheimer’s disease, in particular its inherited forms, the neuropathological hallmarks of FBD include extensive cerebral amyloid angiopathy (CAA), cerebellar degeneration with severe CAA and parenchymal amyloid plaques. There are also hippocampal amyloid plaques as well as neurofibrillary tangles, and white matter degeneration similar to that seen in Binswanger’s disease . Deposition of hyperphosphorylated tau in FBD is indistinguishable from that in AD, both immunohistochemically and ultrastructurally. In prion disease, hyperphosphorylation of tau has been described, but it is not a well-known or well-characterised feature. Not much is known about the relationship between disease duration, PRNP codon 129 genotype, glycotype, histological manifestations and the degree of tau phosphorylation. Several studies have reported the deposition of hyperphosphorylated tau in small series of sporadic, familial and variant forms of prion diseases. These reports highlight the role of prion amyloid plaques as an essential prerequisite to elicit tau phosphorylation and raise important questions related to the mechanism responsible for tau phosphorylation. A detailed discussion of these reports is given below. Several pathways are thought to play a role in neurodegenerative processes, some of which are unusual suspects. A number of cell cycle proteins have recently been implicated in neurodegenerative processes. CDK5, GSK3β, and pAkt are all well-characterised mediators of growth, survival and inhibitors of neur(on)al differentiation. All are now also linked to the family of neurodegeneration—prion protein, Aβ and tau phosphorylation. CDK5, a serine-threonine kinase, is a cell cycle protein that is also responsible for processes, such as axonal guidance, cortical layering and synaptic structure/plasticity, and it is mainly expressed in postmitotic neurones [18, 78]. Dysregulation of CDK5 has been implicated in neurodegeneration for some years [17, 18, 20, 71, 78, 88] and it is now likely to be involved in abnormal phosphorylation of tau. In keeping, CDK5 inhibition alleviates tau phosphorylation and cytoskeletal lesions . GSK3β has recently been identified as a likely candidate directly to phosphorylate tau and mechanistic links between GSK3β, tau [60, 84] and Aβ [45, 46, 51] have been established. A less well described, but mechanistically appealing connection has also been made to PrP, which makes the hypothesis of cell cycle related proteins and neurodegeneration attractive . Another pathway that has been implicated in neurodegeneration involves PTEN/pAkt. The tumour suppressor PTEN antagonises the phosphorylation of Akt, hence downregulation of PTEN increases the phosphorylated, active form of Akt (pAkt), which has pro-survival, pro-proliferation effects and counteracts apoptosis and cell differentiation. However, whilst this function of pAkt is important and relevant for cells capable of self-renewal and proliferation, i.e. the developing CNS, it is different for quiescent/postmitotic cells, such as neurons, where constitutive activation of Akt can cause neurodegeneration , including abnormal phosphorylation of tau, mediated by CDK5 in a GSK3β independent fashion [56, 71]. Whilst the role of Aβ triggering tau phosphorylation is well established [9, 38, 62, 75], a recent study also showed that tau phosphorylation is transmissible too, which may have wide ranging implications for the concept of the involvement of Aβ as the sole trigger for hyperphosphorylated tau in Alzheimer’s disease . Experimental evidence for the connection of tau, Aβ and PrP comes from work of from Perez et al. . Using PrP 106–126 peptides, a widely used paradigm to test prion toxicity in vitro, GSK3β mediated tau phosphorylation was induced. Other studies provide compelling evidence that CDK5, PrP and Aβ are mechanistically connected and involved in neurodegeneration [64, 65]. Inherited prion diseases display a wide spectrum of pathological deposition of prion protein. The formation of conspicuous and well-demarcated amyloid plaques is typically seen in inherited forms with codon P102L (Figs. 4m, 5c) P105L, and A117V mutations (Figs. 4n, 5d), whilst D178N or E200K (Figs. 4o, 5e) mutations show less well-defined plaque pathology. Other mutations, such as octapeptide repeat insert (OPRI) mutations present histologically with a unique striping pattern of the cerebellum (Fig. 4k, l). Reports of tau pathology in inherited prion diseases consistently describe marked dystrophic neurites with hyperphosphorylated tau, accentuated in the vicinity or located within amyloid plaques. The first reports were those of classical GSS with the PRNP P102L mutation [5, 8, 34, 35, 73, 89]. Later studies of P102L GSS with detection of abundant phospho-tau concluded that this may be an effect of PrP-mediated phosphorylation rather than a Aβ related effect, as there were only minimal Aβ deposits seen . However, it may be argued that this latter study detected tau phosphorylation in the entorhinal cortex which has formed independently from the prion amyloid deposition, in the context of Alzheimer’s disease corresponding to Braak and Braak stage I. Other mutations associated with the clinical phenotype of GSS (A117V mutation ), or P105L [53, 95] reported similar findings. In vitro experiments with a prion protein peptide carrying the A117V mutation decreased the rate of microtubule formation more efficiently than wild-type PrP106–126. This was thought to be related to the displacement of tau, where A117V mutation is more efficient at inhibiting microtubule formation . OPRI mutations, such as 96 bp , or 144 bp inserts  into the N-terminal octarepeat region, are characterised by a unique pattern of immunoreactivity for PrP, which is oriented perpendicularly to the cerebellar surface (Fig. 4k, l), also show a marked tau phosphorylation, which co-localises with PrP deposits. A case report of a 216 bp OPRI mutation instead showed a pattern different from those with a shorter insert, with the formation of large amyloid plaques, again co-localising with hyperphosphorylated tau . Finally, the stop mutation 145X  with formation of plaques and cerebral amyloid angiopathy (“PrP-CAA”) showed similar results with tau co-localising to plaques. Following the observation of hyperphosphorylated tau in inherited prion diseases with remarkable tropism to amyloid plaques, but not in sCJD, several studies analysed this phenomenon further: Giaccone et al. compared tau phosphorylation patterns of AD and vCJD and found the same three bands of 68, 64 and 60 kDa in an immunoblot probed for tau. Morphologically, hyperphosphorylated tau co-localised with florid plaques. However, it was also found that unlike in AD, there was no detectable soluble hyperphosphorylated tau in vCJD. In contrast to the findings that we report in our series (see below), their study did not detect hyperphosphorylated tau in brains of sCJD patients . A study comparing the ultrastructure of prion amyloid in GSS and vCJD  came to a similar conclusion, but in addition found that dystrophic neurites containing hyperphosphorylated tau occurs in sCJD with small plaques. It was concluded that plaque-forming prion diseases are capable of generating phospho-tau deposits, but forms with synaptic PrP deposits may be incapable to do so . To examine this further, we examined 79 brains from patients with sporadic CJD and compared them to 12 cases with inherited prion disease and 5 vCJD cases. We can demonstrate for the first time that there is indeed presence of hyperphosphorylated tau in sCJD with synaptic (Figs. 1j–l, 6i, j) or pericellular PrP, notably also in the absence of plaques (Figs. 3a–c, 6a, b, e, f). When considering with the previous reports, we detected a very substantial formation of phospho-tau positive rods in five cases of vCJD, including two cases of blood transfusion related transmission (Fig. 4j). In those cases with concomitant Aβ amyloid pathology (mild, n = 14), we found both patterns, namely granular, rod-shaped PrP-induced tau inclusions (Fig. 3a–c) and thread-shaped Aβ related formations (Fig. 3d–f). Cases of inherited prion disease (P102L, A117V, D178N, E200K, 96 and 144 bp octarepeat insert) show accumulation of tau directly associated with prion protein plaques (Figs. 4p–t, 5f–j). In our series of sporadic, inherited and variant forms of prion diseases (n = 79), we found a correlation of prion protein burden (Fig. 1) and the formation of rod or stub-shaped tau deposits in the neocortex (Fig. 3; Tables 2, 3). Previously, the ability of prion protein to hyperphosphorylate tau was thought to be associated with the presence of amyloid plaques, as seen in vCJD, GSS or certain forms of sCJD. We show here in a large cohort, that indeed synaptic PrP is directly associated with the presence of minute deposits of hyperphosphorylated tau. Regions in which prion protein deposits across the entire thickness of the cortex also show the presence of tau rods in the same area (Fig. 6i, m). Other cases where the burden of abnormal prion protein is restricted to deeper cortical layers show a distribution of tau rods congruent with prion protein accumulation and neurodegeneration (Fig. 6a, e). In sCJD, deposition of tau significantly correlates with the intensity of prion protein load (correlation coefficient r = 0.69, p < 0.01), but does not correlate with disease duration (r = −0.037, n.s.). Importantly, the size of tau granules in sCJD with homogenous synaptic PrP was smaller than that in sCJD with formation of large PrP granules. To exclude that the tau phosphorylation was induced by coexisting Aβ amyloid, we stratified for presence or absence of Aβ amyloid (Tables 2, 3). Almost half of the cases (n = 36) were entirely free of any form of Aβ, a small number showed patchy, mild and diffuse deposits of Aβ (corresponding to Fig. 2a) (n = 13) and the remainder showed more intense diffuse Aβ and/or core plaques (see Fig. 2b–e) (n = 27). The morphology of hyperphosphorylated tau associated with abnormal prion protein is remarkably distinct from that elicited by Aβ, in particular in cases of synaptic PrP deposition (Fig. 3). Prion protein related tau hyperphosphorylation shows as short stub- or rod-like structures (Fig. 3a–c). The most subtle deposition forms small rod- or stub-like punctate inclusions (granules). Their shape resembles granules seen in argyrophilic grain disease . They do not extend to fibrillary or “neuritic” tau, whilst the most subtle deposition of Aβ-associated tau fibrils occurs in the form of thin, single neuritic threads in the cortex (Fig. 3d). The next stage of Aβ-induced tau phosphorylation is a more frequent presence of fibrils (Fig. 3e), and finally the Aβ-induced tau pathology amounts to a delicate network of dystrophic processes (Fig. 3f), including neurofibrillary tangles. Amyloid plaques are generally surrounded by a small corona of dystrophic neurites, which are well known and have been frequently described in the literature. The temporal and entorhinal cortex was excluded from the analysis because this area shows a tau pathology that emerges independently from Aβ or prion protein pathology, and is likely to represent an independent pathogenic process, which may explain the findings of Ishizawa et al. . It is possible, but difficult to prove whether phosphorylation of tau in this area may be enhanced by the deposition of prion protein. Those forms of prion diseases, which show labelling of perineuronal networks and small plaques , show tau rods in the vicinity of the perineuronal nets and around small plaques. In our series, microplaques in sCJD (Fig. 4d) as well as inherited forms with prominent plaques (Fig. 5) showed an obvious accumulation of tau at a higher density (Fig. 6e–h) forming short processes resembling dystrophic neurites. However, these intraplaque and periplaque neurites were still more granular than those associated with Aβ plaques. Importantly, this phenomenon was observed in the absence of any Aβ pathology. The most straightforward explanation of PrP-associated tau phosphorylation is a simple dose-dependent direct toxicity whereby PrP amyloid is directly involved in the process. Alternatively, a critical level of toxic species may be produced during the conversion process, which is thought to involve a number of conformational intermediates or side products during prion conversion and propagation, variably named as PrP*  or PrPL (lethal) . These toxic (by-) products, may directly or indirectly trigger pathways mentioned above and hence contribute to tau phosphorylation. However, considering the kinetics of abnormal protein accumulation in prion diseases , and the relative abundance of prion amyloid in comparison to hyperphosphorylated tau, makes the latter a likely side effect rather than a main trigger of prion neuropathogenesis. However, the dissection of the events involved in tau phosphorylation may well be the key to understand prion neurotoxicity. Phosphorylation of tau in the cerebellum: an underestimated feature? In our series of sporadic, inherited and variant forms of prion diseases, we detected formation of rod-shaped tau deposits in the molecular and granular layers. Some forms of sporadic prion diseases form abundant small plaques, alongside with synaptic PrP, which is associated with marked periplaque hyperphosphorylation of tau. The same observation is made in inherited prion disease with the predominant formation of cerebellar plaques, such as P102L GSS, where tau is associated with, but not limited to, plaques. We show here that sporadic forms trigger tau phosphorylation in the cerebellum in a “load-dependent” fashion (Fig. 4; Table 3), where cases with a relatively low cerebellar burden of abnormal PrP show fewer rod-shaped tau positive inclusions (Fig. 4a, f) than those with an intermediate (Fig. 4b, g) or high PrP load (Fig. 4c, h). This correlation is statistically significant for sCJD (correlation coefficient r = 0.39, p < 0.01) which increases when all forms of prion diseases are included (r = 0.50 p < 0.01). Tau phosphorylation in the cerebellum occurs in the molecular layer (Fig. 4f), granular layer (Fig. 4g) and in the Bergmann glia/Purkinje cell layer (Fig. 4h, i). vCJD is characterised by a particularly heavy deposition of abnormal PrP in the neocortex and the cerebellum (Fig. 4e), again there is a significant and dense deposition of hyperphosphorylated tau in all areas (Fig. 4j, molecular layer). When comparing the cerebellar tau in brains with 96 bp OPRI, 144 bp OPRI, P102L, A117V and E200K mutations (Fig. 4k–t), we found that (1) plaque and synaptic PrP elicit a similar degree of tau hyperphosphorylation, but (2) varies between genotypes, which is particularly evident when comparing with 96 and 144 bp OPRI (Fig. 4s, t). These findings can be interpreted as follows: (1) within one type of PrP (e.g. sCJD prion protein) the degree of tau phosphorylation is likely to be dose (or load-) dependent, as shown in Fig. 4a–c and f–h; whilst (2) each genetic mutation is able to elicit a response that is specific to a given mutation, suggesting that the PrP load and tau phosphorylation may not be comparable between different mutations (Fig. 4p–t). The relatively small number of inherited forms investigated here does not allow for robust statistical analysis. It has been argued that the long duration may contribute to the extent of tau phosphorylation, as vCJD and GSS show significantly higher tau load and have longer incubation times than sCJD. We show here that there is no correlation between the duration of the illness and the degree of tau phosphorylation. Prion protein load appears to be the main factor triggering tau phosphorylation. The capacity of cerebellar neurons to hyperphosphorylate tau has only recently been recognised and is probably generally underestimated. Primary tauopathies, such as progressive supranuclear palsy (PSP) are examples of the capacity of cerebellar Purkinje cells [55, 80] or neurones of the dentate gyrus  to hyperphosphorylate tau. In patients with PSP or corticobasal degeneration, the clinical phenotype of cerebellar ataxia is directly associated with the progressive accumulation of hyperphosphorylated tau in Purkinje cells . Another disease featuring tau phosphorylation in cerebellar neurones is Niemann–Pick disease where defects in the intracellular trafficking of exogenous cholesterol causes neurodegeneration. Neurofibrillary tangles in the cortex of Niemann–Pick brains are morphologically similar to those in AD. In the cerebellum, there is a marked deposition of phospho-tau in the dentate nucleus and granular layers of the cerebellum , but a remarkable absence of neurofibrillary tangles (NFT) is noted . Several mouse models have addressed this  and whilst accumulation of hyperphosphorylated tau in cerebellar granule or Purkinje neurones can be successfully achieved in several mouse models (stress-induced , Niemann–Pick disease type C , pAkt-mediated tau phosphorylation ), no model has yet achieved formation of NFT, highlighting a specific pathway or cellular machinery required for NFT formation that is absent in the cerebellum . A transgenic mouse expressing human P301L mutant tau did not show cerebellar tau at all . One of the reasons that cerebellar tau phosphorylation is widely underestimated is the presence of abundant cortical phospho-tau in the neocortex in Alzheimer’s disease whilst it is strikingly absent from the cerebellum, due to the lack of significant Aβ accumulation in the cerebellum. If at all, Aβ deposits in the cerebellum only at late stages of the disease process. Only few studies have demonstrated Aβ deposition in the cerebellum  forming diffuse deposits, but no plaques with dystrophic neurites . Cases of familial AD can show a significant Aβ burden in the cerebellum, and can form deposits of various shapes and sizes . In the same series, cases with sporadic AD showed diffuse and granular deposits, and may, therefore, have represented a group with high overall Aβ load . More commonly, vascular Aβ may cause cerebellar haemorrhages  or infarctions . Familial AD cerebella accumulate mutant Aβ42 [54, 72], whilst in sporadic AD, these deposits are composed of Aβ40 amyloid in humans  as well as in experimental models . Most studies including recent multicenter studies of the neuropathology of AD have not systematically examined tau hyperphosphorylation in the cerebellum [2, 3]. A recent biochemical and confocal imaging study has demonstrated co-localisation of tau and Aβ in synaptosomes of all brain regions, including the cerebellar samples, which showed the lowest levels within the CNS . In contrast to Alzheimer’s disease where cerebellar Aβ is essentially absent, most sporadic, inherited and transmitted forms (iatrogenic CJD, variant CJD and Kuru) of prion disease are characterised by a substantial prion protein deposition in the cerebellum (Fig. 4e). In sCJD, cerebellar prion protein is often seen as synaptic, homogenous deposit in the molecular layer and to a lesser extent, in the granular layer (Fig. 4a–d). Other typical patterns are characterised by small granular deposits, which may become confluent to form microplaques. Kuru, an acquired prion disease in humans, transmitted by oral uptake during mortuary feasts in the Fore linguistic group in Papua New Guinea, is clinically characterised by cerebellar ataxia, rather than dementia, and shows a marked involvement of the cerebellum, with formation of dense plaques of variable sizes [12, 43]. Iatrogenic prion disease can be caused by a wide variety of procedures, mostly due to the transmission of CJD prions contained in contaminated growth hormone derived from human cadavers, or by implantation of contaminated dura mater grafts [15, 39], transmission of CJD prions during corneal transplantation [28, 47], contaminated electroencephalographic (EEG) electrode implantation or surgical operations using contaminated instruments or apparatus . The pattern of prion protein deposition is characterised by synaptic PrP and formation of small and medium sized plaques in neocortex and in the cerebellum. Finally, vCJD in the UK and other countries, caused by human exposure to BSE prions from cattle (Collinge et al. 1996; Bruce et al. 1997; Hill et al. 1997; Collinge 1999; Asante et al. 2002), is characterised by extensive plaque formation including the cerebellum. The capacity of disease-associated PrP to trigger phosphorylation of tau has been discovered sequentially. Early reports have described this phenomenon in obvious cases, where abundant plaques were present. 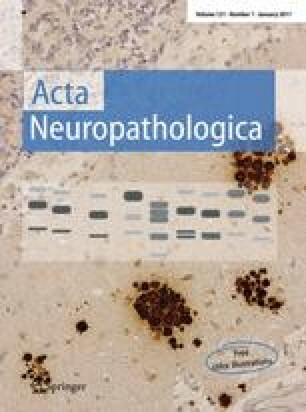 Increasing awareness and understanding of this phenomenon and refinement of immunohistochemical and biochemical techniques have subsequently triggered additional studies, extending the observation to variant CJD and plaque-forming sporadic prion diseases. In parallel, the recognition of prionopathies and prion-like mechanisms as a concept for neurodegenerative disease pathogenesis has triggered a wealth of comparative experiments which led to the discovery of similarities and functional relationships between Aβ and prion protein. Tau takes part in this process and we have highlighted the evidence that may represent a mechanism of amyloid toxicity. Although the relationship between amyloid toxicity and tau phosphorylation appears straightforward in our cohort of sCJD cases, the issue may be more complicated in inherited prion diseases. Other parameters that were not systematically addressed in our study are genetic (tau haplotype, PRNP codon 129 genotype) or demographic factors (e.g. age of onset). Our data presented here underpin the concept of amyloid-triggered tau phosphorylation, further contribute to the understanding of the relationship between prion amyloid and tau toxicity and set the scene for future research on larger cohorts. Furthering the study of pathways involved in tau phosphorylation may also be the key to understand prion neurotoxicity.